Mordian 7th Regiment: Heresy Era Thousand Sons - Something old, something new! Heresy Era Thousand Sons - Something old, something new! Busy week out in Real Life(tm), but I did get a package in the mail containing a blast from the past! 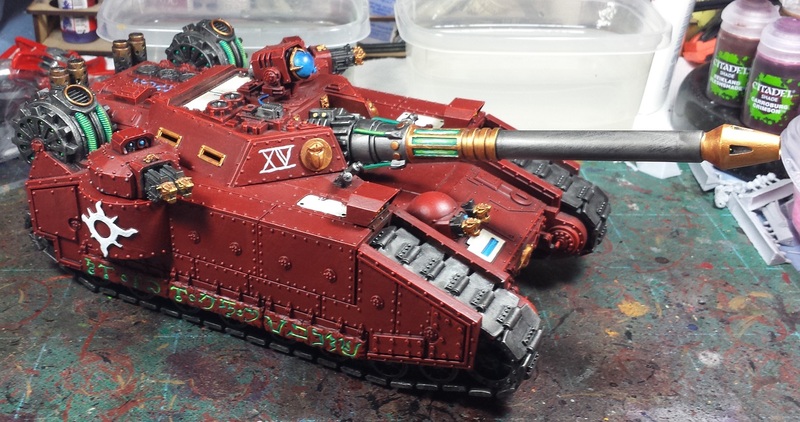 Back in the Tempus Fugitives era when I first got into the Heresy, my first iteration of the Thousand Sons force included my favorite of the superheavy tanks - The Falchion Eye of Magnus. Custom built by the inestimable Tom McBride (of Blood and Skulls) and somewhat hamfistedly painted by me, it was one of my biggest source of sellers remorse that I'd let it go. Turns out the guy that it was sold to was planning on selling off his force, so I jumped at the chance to buy it back! It's a little the worse for wear (it was built and sold back in 2012) so I had to do a bit of repair work, and plan on updating the paint scheme a little to match up with the current forces. ...Which means among other things I've got about 8,000 rivets to paint. Oof! On the other side of the coin ,over the last several evenings I have squeezed in a few abbreviated painting sessions and finally this evening got the gold trim laid in on all of the veterans. This was a long, tedious process but now that it's done the rest of the scheme should zoom right along! Wow - what a return - great seeing this again mate. Looking forward to seeing how you 'improve' on the classic. Good to see the old girl back! So. Much. Trim! Well done for powering through it. Glad you managed to re-address your sellers remorse. You must of been so happy Joel! That is awesome you got your beauty back! fun to see how far your painting has come too! @Frothing Muppet: Indeed, I was pretty jazzed to have it in hand again! @Rory Priest: Oh man, these twenty almost broke me. Oof! @NafNaf: Haha! Not looking forward to doing the zillion little dots! @Greg Hess: Hah! It was a good day when it arrived in the mail! @Zab: Indeed! Looking forward to updating the beast! It certainly is a cool looking superheavy tank. Good luck with those rivets though... it hurts my eyes just imagining trying to pick them all out! @Dai: Indeed, that's going to be a project for a rainy day when I'm reaaaaaally bored. Hah!